Daily news updates and press releases from Sinn Féin Republican Youth- Irelands fastest growing political youth organisation. 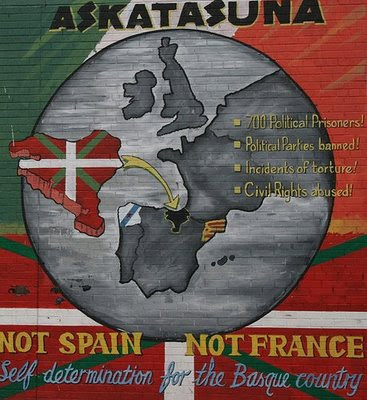 Representatives from the Basque pro-independence youth organisation Segi visited Belfast from 13-15 November to participate in the Ógra Shinn Féin National Congress. 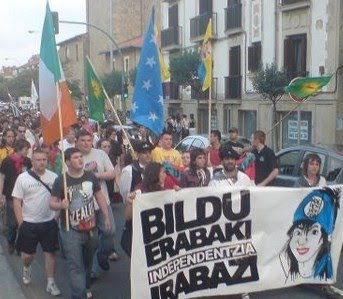 “As Ógra Shinn Féin celebrates 100 years of the Irish republican youth movement since the foundation of Na Fianna Éireann, we in Segi are celebrating 30 years since the formation of our predecessor organisation Jarrai,” the Segi representative told An Phoblacht. 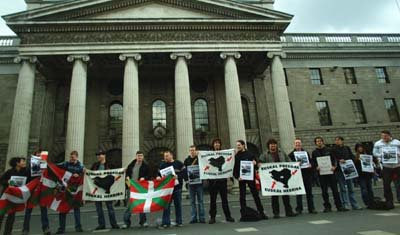 The representative said that this year judgements have begun being handed down by the Spanish courts against Segi activists. Happy Birthday Ógra Shinn Féin Blog! Argos – the shop where they not only reserve goods, they reserve some staff as well. The Rosary at Republican Commemorations? - AGAINST! Sinn Féin Colleges Dublin Trip – Bígí Linn! Ógra Shinn Fein welcomes Belfast court decision. Don't Extradite the Basques Rally – Bígí Linn! Ógra activist wins Mock Dáil Event. Cllr Pádraig Quinn, Sinn Féin, 23. © Copyright Ógra Shinn Féin 2011. Awesome Inc. theme. Powered by Blogger.